The singer-songwriter reunites with producer Jeff Trott to deliver a strong return to rock and her earliest albums. Sheryl Crow’s Tuesday Night Music Club came out nearly 24 years ago and started a recording career that has explored many styles, from rock to pop and country. For Be Myself, her ninth album she reunited with producer Jeff Trott to write and record a collection of songs that recaptured the spirit of that debut and the career it generated in the mid-'90s. The effort is largely successful, and the reunion with Trott and editing and mixing by Tchad Blake (another return after nearly two decades, too) capture the feel of her early records. But, there is a persistent longing in the tracks, a desire the creeps through each track to do more than dust off past successes and dispense with later blues and country-influenced albums, like Crow’s 2013 effort Feels Like Home. The intent to connect her early career to this album, while simultaneously pushing against the later materials flows from grooving keyboards, grungy guitar, and raw vocals, particularly in the album’s title track. The album builds up to this track, with the opening tracks ruminative and thoughtful about a life lived and looking ahead as if both actions were ditched for other pursuits. It’s a slow open from “Alone in the Dark", through “Halfway There", and “Long Way Back", and the title track finally captures the return Crow, Trott, and Blake are intent on telling and capitalizing upon. While “Be Myself” fully embodies the sound and style of Crow’s mid-nineties output, she still infuses the album with the work of a long career. “Roller Skate” effectively blends the longing for the mid-nineties with the pop of Crow’s early 2000s albums, while “Love Will Save the Day” could be at home on Wildflower (2005) as much as it fits here. The mood of the album changes drastically on “Strangers Again", and the impact of harsher instrumentation and angrier lyrics creates a divergence from the album’s first half as well as seems to dispense completely with anything that followed Sheryl Crow (1996). It’s about loss and the realization that no matter what, no return is possible, even as it returns to the anger and hard qualities of her second album. What follows are songs that explore the future, consoling listeners that Crow was with them in the mid-nineties and her music is still with them now. “Rest of Me” evokes both a softer approach and a direct appeal. The most appealing track on Be Myself is “Heartbeat Away", a raw, lengthy appeal that combines the harder rock of her 1996 album with the blues of Detours (2008) and 100 Miles from Memphis (2010). It’s a loud, stinging track, and certainly one that will play nicely in concert with audiences. Crow explores a readiness to find her early influences, escape the missteps of her past, and confront an uncertain future. 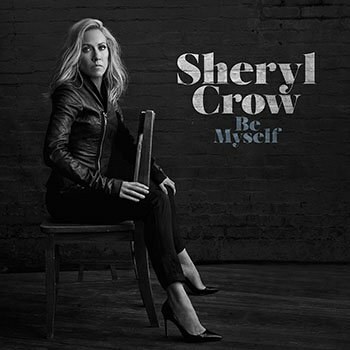 Across her ninth album, Be Myself, Sheryl Crow and producer Jeff Trott, play with the style of her most successful records, and in turn create an album that acts like a greatest hits package. The familiarity of her career is this album’s foundation, despite the outright rejection of aging that Crow imparts in the final two tracks “Grow Up” and “Woo Woo.” A career as productive as Crow’s is worth exploring, and though the album may not inspire you to dust off her old records, it’s enjoyable, fun, and reassuring in its renewal.